So you are engaged, have sent save the dates, are trying to figure out how to stay within your tight wedding budget, and now need a wedding registry. While it may be tempting to go with a higher end store, it’s both more practical and beneficial to you if you stick with a quality discount retailer. Your guests are on a tight budget, too. 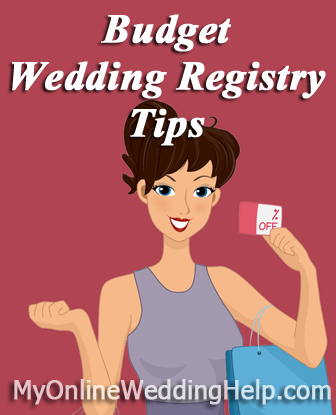 It’s unlikely they can easily afford many of the items on your registry if you opt for a high-priced store. For example, as of this writing a Calphalon 4 Quart Slow Cooker at Crate and Barrel is $79.95. The 6 Quart Crock Pot at Target is $23.99 as of this writing. More folks are likely to be able to afford the Crock Pot. Use a registry with good perks at a modestly-priced store. A while back I researched registries and found three with more benefits than the rest. While prices are approximately comparable between the three, Kohl’s has frequent, quite lucrative Kohl’s Cash promotions. If your guests buy a gift during this period, they can get more merchandise free, at a later date, for dollars spent (each varies, but $10 back for $50 spent is a recent example). Also, as of this writing, customers purchasing off a registry get 20% off if they buy at least $100. You have more options at a general department store than specialty retailer. One or both of you are likely to have already set up household. Consequently, your needs may be less than traditional. In this day and age it is perfectly OK to expand your choices to other items you will use. You will want to choose a retailer that can accommodate. Looking at Pottery Barn versus Target, for example, the former is limited to household items. The latter also carries electronics, luggage, sports equipment, automotive items, and more.